It doesn’t take much to freshen your house for spring! Here are easy blue and green spring decorating ideas for the foyer, living room and dining room. It’s been all about spring around here lately, and I’m loving it. Even if it’s not totally spring weather outside yet (come on already!! ), freshening up inside makes it feel like spring is coming, doesn’t it!? My friend Jenna from Wife in Progress is hosting an awesome group of bloggers for this week’s Styled For Spring Home Tours so be sure to hop around to the other bloggers’ linked at the end of this post. If you’re hopping over from My Thrift Store Addiction or are new around here, welcome! I’m so glad you found me – you can learn more about me here or tour our house here. We’re still in the process of decorating, um, more than a few rooms around this rental house, but the back foyer, living room and dining room are done (or almost done in the case of the dining room), so I added a few blue and green spring touches in those rooms. Is it weird that this little back foyer is one of my favorite spots in the house? It’s actually just a blank wall in our kitchen we made work for us, and I loooove it. It’s the perfect drop zone for coats, scarves, boots/sandals (spring weather is weird), Oakley’s leash, keys, you name it! And not only does the bench have those cute crates for hiding our shoes, it has room for throw pillows! My fave. Scarves – might as well double cute clothes as decor, right? Leave a few scarves out in your favorite spring colors, and it’s instant decor! Put away the winter stuff – Depending where you live! Hopefully, you’re lucky enough to stash away at least the heaviest coats and boots till next year! I shared a whole spring tour of our living room last week (and the spring mantel yesterday), so I won’t share alllll the photos again, but here are a few of my faves. You can see even more of our blue and green living room here. Plants – again, faux or real. I use the little topiaries on the mantel throughout the year, but faux plants always seem especially perfect in the spring and summer. Switch things up – even if you don’t go crazy, just rearrange the mantel or wall shelves a little, or swap the pillows on the couch with pillows from your bedroom. The room will instantly feel fresh and new! We took the green pier photo in Folly Beach, SC. You can download it for free here. I shared our simple spring dining room last week, too. 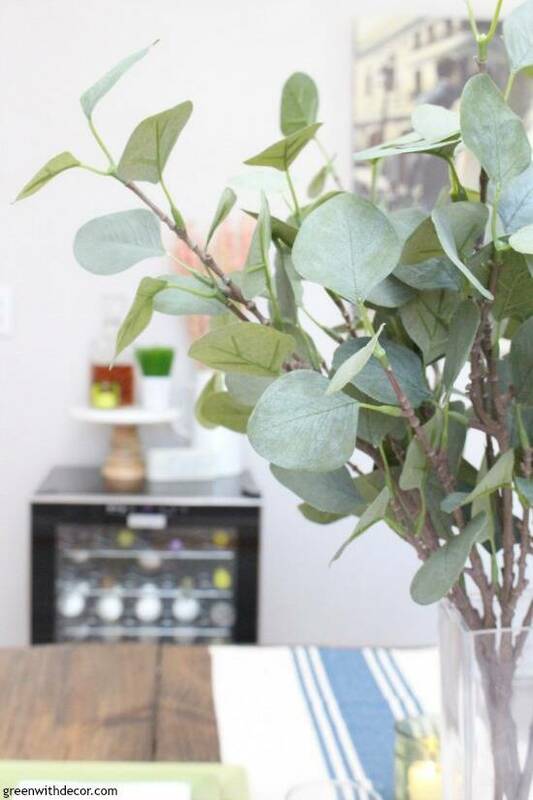 I kept it pretty easy with some awesome faux eucalyptus for a centerpiece and a new table runner my mom grabbed me (love having a personal shopper – ha!). Plants – faux or real! Notice a spring theme? Plants and flowers, ha! This faux eucalyptus is my new obsession. Napkins or placemats – Even just new paper napkins can add a little ‘newness’ to the table. New placemats or chargers (I just bought these!) can give the table a new feel, too. Switch things up – I might just repeat the same tips from room to room, but hey, they work! A new centerpiece or table runner makes a table feel fresh and springy. Remember to hop around to see all of the gorgeous spring decorating ideas from the bloggers below. My friend Amy from My Life at Home is up next – her new house is gorgeous! All of the touches of blue you’ve added look perfectly perfect against your signature greens! I especially adore that table runner – I need to get me a personal shopper, too! I always come to your blog looking for inspiration and leave with my cup full. Thank you for sharing such beautiful inspiration! Thanks so much, Jen – what a sweet comment! 🙂 I am loving how blues and greens look together lately! Thanks, Cecilia! Glad we could tour together! Such a pretty home tour. Your entryway is just darling, and I love the box shelves in your hallway. It’s such a great storage option. Thank you for sharing. Thanks, Sue! We just love how the entryway came together! 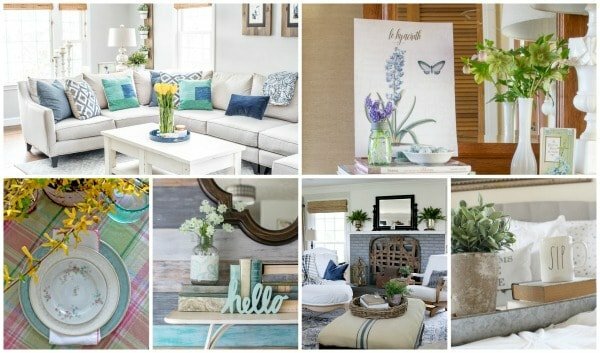 You have some great tips for decorating for Spring! Gorgeous Spring home tour! Meg., you really have a way with green. It looks so natural, organic and soft in your home. Love all the natural wood, both painted and stained. Once again, happy to be on the Spring Home Blog Tour with you. Thanks so much, Carol! Glad we could tour together! 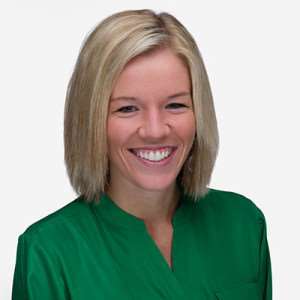 Meg, you have done a beautiful job styling your home for spring and all of your tips are great. I love adding pillows and flowers too. I have enjoyed being on this spring tour with you. Happy Spring! Thanks, Sherry! Glad we could tour together! Meg I am a blue and green girl as well! I knew I liked you! 😉 I also love that we both used dried hydrangeas in our home tours! Great minds think alike. Your tour was beautiful! I love all your spring touches, Meg! So pretty! Thanks, Jenna! And thanks for organizing such a great tour! Meg, your house is so beautifully decorated for Spring! I love the idea of using scarves as decor in the mudroom! It’s been fun being on this tour with you!! Thanks, Leen! Scarves are so fun and easy to use! I love the blues mixed in with your green decor! Your entryway is so cute (and organized! ), I am loving those hooks! Thanks, Stephanie! The crates and hooks make it so easy to keep organized – gotta love easy, haha! Fabulous tips, Meg! And I love all your touches of blue and green – my favorite. So happy to be touring with you again. Thanks, Susan! Glad we could tour together again, too! Your “drop zone” is perfect Meg! I love all the blues and greens in your gorgeous house. You have such great style! Thanks so much, Melissa! I just love that little space! Meg, I so love how you combined blue and green for your Spring decor! Its so fresh and cheerful! Thanks, Jordan! I’m loving blue and green together lately! Such a pretty Spring foyer! I love the pretty green and blue colors!